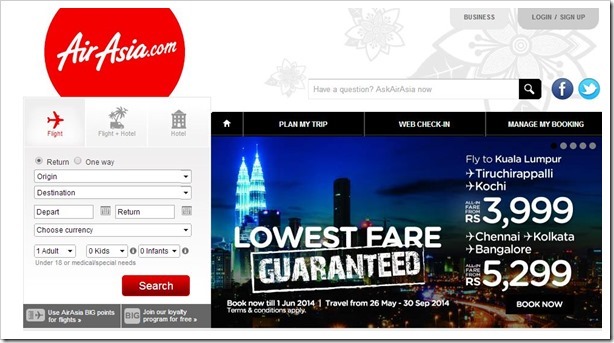 Air Asia becomes the first foreign airline to start it’s domestic flights in India. They will start their operations from June 12th and bookings start today, May 30, 2014. Air Asia India is a sister entity of low cost Malaysian carrier, which has entered India via joint venture wherein Tata Sons hold 30% share, Telstra having 21% share and the remaining 49% with the parent company. Interestingly, this opening of Air Asia also marks Tata’s return to aviation industry after a gap of 60 years! Air Asia has set up its base in Chennai, and their operations will start from Chennai-Bangalore-Chennai route and a daily flight on Bangalore-Goa-Bangalore sector. Although at the time of writing, the flight details were still not available. With this launch, Air Asia is now directly competing against other low cost carriers in India: SpiceJet, JetKonnect, Indigo, GoAir and Air India Express. Air Asia India CEO Mittu Chandilya has promised that the fares on their airlines would be 35% cheaper than other airlines. Additionally, Air Asia will also allow 15 KG of free check-in baggage, something which Air Asia doesn’t provide anywhere else globally. The directorate general of civil aviation (DGCA) has given clearance to Air Asia’s domestic operations on May 7th and cleared its schedule on May 8th, which is the fastest we have witnessed in this industry. Just for information, Air Asia has announced their inaugural flight on the same day when TDP leader Ashok Gajapathi Raju Pusapati took over as the new Aviation Minister. And in his earlier interviews, Raju has not ruled out re-examining of approvals and permissions granted by the previous government, which were done in a hurry. Spicejet Announces Whopping 75% Off On Domestic Fares!